When Lee Young-moo entered Hanyang University as a student in 1973, the school’s emphasis on its founding principle, “Love in Deed and Truth” did not mean much. But as he got older, the principle could not have been more right, the now university president said. Hanyang University which was established as Korea’s first private engineering institute (DongA Engineering Institute) in 1939, is striving to become the No.1 university in the field of social innovation. “As far as universities are concerned, we live off what we learn here. But it should not end in ourselves. 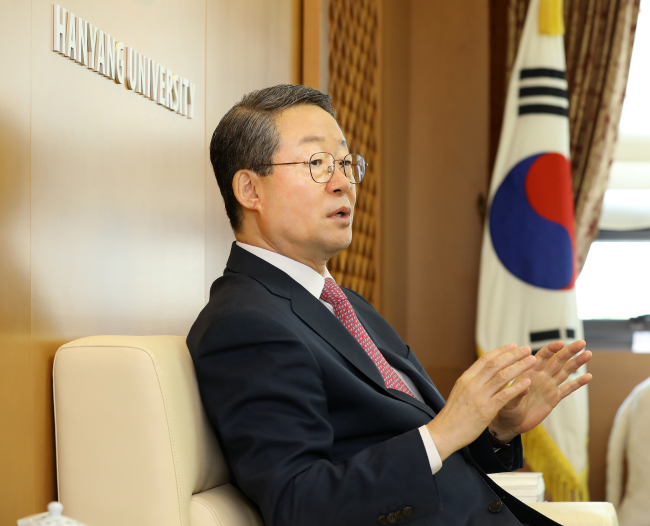 Trying to find ways to help others and contribute to the society, that is the mindset we seek to deliver to our students,” Lee said in the interview with The Korea Herald at his office on July 20. While the term “social innovation” was introduced to the school by Lee when he became the president in 2015, it did not come out of thin air, Lee explained. For all Hanyang students, 32 hours of community service is required for graduation. While it is common for universities to have student volunteer groups nowadays, it was Hanyang university that first created such a group back in 1994. It also has an alumnus service group, which is rare among universities, the school said. Such background made it possible for Hanyang University to become the first university in East Asia to be designated as an Ashoka U Changemaker Campus in April. Ashoka U is an initiative that started in 2008, promoting higher education institutes to play roles in addressing social problems and drive changes. 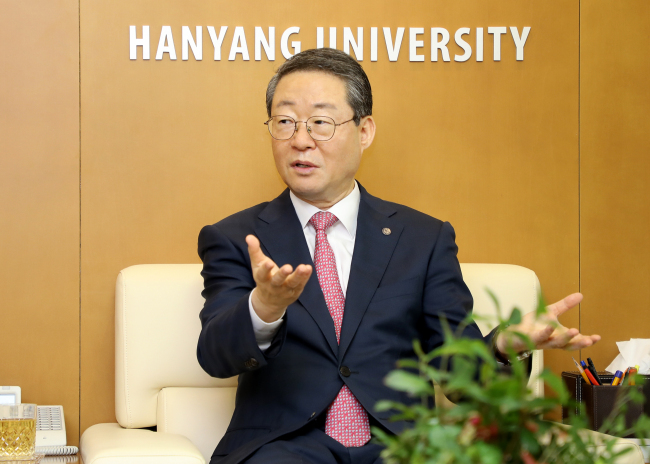 Hanyang University joined the network of 45 universities in nine countries, which includes Cornell University, Brown University and Johns Hopkins University. With the connections formed via Ashoka U, Hanyang University is reviewing starting a social venture with Babson College in the United States and is discussing with Stanford University on publishing the Korean version of “Stanford Social Innovation Review,” which is a magazine published by the Stanford Center on Philanthropy and Civil Society. Moving their social innovation work to the global playing field, the university launched “Hanyang University for Global Engagement” program to provide its students opportunities to cooperate with ASEAN countries. While he has a busy schedule as a university president, Lee has not given up his role as a researcher and a teacher. While taking on administrative work on weekdays, he still meets with graduate students in labs and gives counselling on weekends, he said. Lee also reviews papers submitted to the Journal of Membrane Science, of which he is an editor. Lee also highlighted how strength in research is an important factor in strengthening the identity of a university, in the fast-changing society. Much effort on practical research area has seen its light, and the school ranked 23rd of Nature Index 2017 Innovation, which measures an institution’s influence on patents by looking at factors such as the number of references. As for the educational environment, Hanyang University is working to introduce “problem-based learning” method, pushing the students to develop and present their own ideas to social problems. “For the students to have competence in the ‘fourth industrial revolution’ era, teaching should change. Students should be the main players of the classrooms, and professors step back and become the coach,” Lee said. Ultimately, the students will be able to lead discussions and build their own logics based on the theories they learn, Lee added. Approximately 9,500 foreign and transfer students study at Hanyang University annually. The school’s Global Information Center is responsible for all inquiries the foreign students may have, and offers cultural exchange and counseling programs. Respecting diversity, the school also installed a special prayer room for Muslim students, and its cafeteria offers Halal food.